The mission of NIACC Library So Inclined Gallery is to provide a venue for students, faculty, staff, and alumni of the College and residents of the North Iowa area to display their art work, to increase awareness and/or for the purpose of promoting sale of the work. The Gallery accepts submissions continuously, and will display works for a term agreed upon between the artist and the Gallery. A little art…if you’re so inclined! 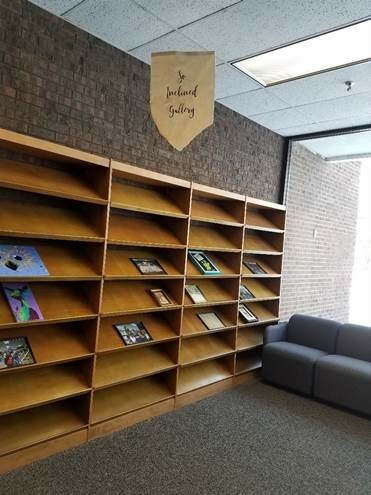 The gallery is a repurposed magazine display area in the library. The largest work which can be displayed is 16” H X 30” W X 1” deep. Only flat works can be displayed. The Gallery cannot accommodate sculpture or 3-D artworks. All paintings must be framed or have the edges of the canvas painted. Your work should appear finished and ready to display. No wet paintings will be accepted in the gallery. Artwork should be neat, clean, and look finished. Prints and photography should have clean edges. You must complete and print labels and attach one securely to each piece of artwork. Please contact the library director at librarian@niacc.edu if you are interested in showing your work in the gallery.